If you're in the market for a new ring, knowing your finger size is essential. There are several ways to measure for a new ring, including comparing the size of an existing ring, measuring your finger with a piece of paper, and comparing the measurement of your finger to the ring size. 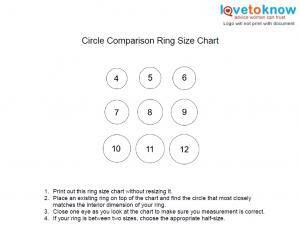 These free, printable ring size charts can help. Print this circle comparison size chart! This ring sizer allows you to find the size of an existing ring. This is a great choice if you have a ring that fits perfectly on your desired finger. It's also the perfect type of chart if you need to secretly find someone else's ring size. Click on the image of the chart and download it to your computer. 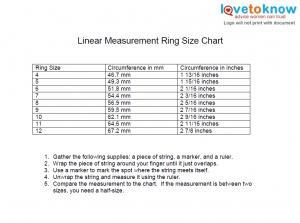 Print the ring size chart without resizing it. Place an existing ring on top of the chart and find the circle that most closely matches the interior dimension of your ring. Close one eye as you look at the chart to make sure you measurement is correct. If your ring is between two sizes, choose the appropriate half-size. 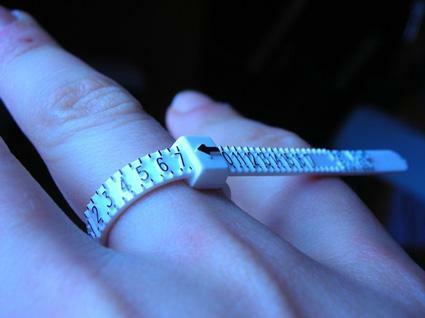 Print this finger ruler ring sizer! Use this chart to measure ring size right on the finger itself. It's very accurate, since you can test the size by slipping the paper ring on and off a few times. Click on the ring sizer image and download the chart to your computer. 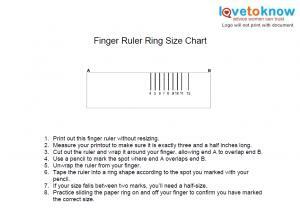 Print the finger ruler without resizing it. Measure your printout to make sure it is exactly three and a half inches long. Cut out the ruler and wrap it around your finger, allowing end A to overlap end B. Use a pencil to mark the spot where end A overlaps end B.
Unwrap the ruler from your finger. Tape the ruler into a ring shape according to the spot you marked with your pencil. If your size falls between two marks, you'll need a half-size. Practice sliding the paper ring on and off your finger to confirm you have marked the correct size. Print out this linear measurement chart! Another way to measure your ring size is to take the actual measurement of your finger and compare it against the specified measurement for that size of ring. This helpful chart features measurements in both inches and millimeters. Click on the chart and download it to your computer. Gather the following supplies: a piece of string, a marker, and a ruler. Wrap the piece of string around your finger until it just overlaps. Use a marker to mark the spot where the string meets itself. Unwrap the string and measure it using the ruler. Compare the measurement to the chart. If the measurement is between two sizes, you need a half-size. Jewelers in different countries use different ring measurements and will convert sizes differently. A conversion chart can help couples compare a United States ring size to a European ring size, for example. If you find yourself in this situation, try out The Official International Ring Size Conversion Chart. Measure the finger in the middle of the day and at normal temperature. Extreme heat or cold can change ring sizes as blood vessels contract or dilate, and the same effect can occur with mood swings, a woman's menstrual cycle, or after vigorous exercise. Consider knuckle sizes. Individuals with slim fingers but thicker knuckles will want to be sure the ring size can accommodate moving the ring over the knuckle. Use a 100% scale when printing the chart. Many printers will automatically resize images before printing, but resizing a ring chart will make its measurements useless. Always round up to a larger size if necessary. Not all jewelers offer half or quarter ring sizes, and if the ring size is questionable between two numbers, it is best to choose the larger size. Try several types of sizers if possible. Averaging the sizes can create a more accurate measurement than a single chart. Knowing the proper ring size before you start shopping can help you find a ring that will fit perfectly the first time you slip it on. With an engagement ring or wedding ring, that first moment is important, and using a ring size chart can help ensure it happens the way you imagine.